Osteopetrosis (plural osteopetroses) is a rare inherited disorder that makes bones increase in both size (mass) and fragility. It is a potentially fatal condition that can deform bone structure and distort the appearance. Osteopetrosis is also called chalk bones, ivory bones, or marble bones. In healthy individuals, bones are constantly being broken down (resorption) by cells called osteoclasts, and new bone material is constantly being formed by cells called osteoblasts. Osteopetrosis occurs when there is a failure in bone resorption. The mass of bone increases, but the new bone material that is added is porous, weak, and brittle. There are three types of osteopetrosis. In some children with osteoporosis, bone mass begins to increase at birth, but symptoms may not become evident until adulthood. In mild cases, bone mass increases at gradual, irregular intervals until full adult height is attained. Some bones are not affected. Other forms of osteopetrosis progress at a more rapid pace and destroy bone structure, which can involve bones throughout the body, although the lower jaw is never affected. Severe malignant infantile osteopetrosis (early-onset osteopetrosis) is the most severe form of osteopetrosis. It results from a child inheriting defective genes from both parents (autosomal recessive pattern of inheritance). It is most often discovered soon after birth. The ends of the long bones of the arms and legs appear widened and thickened (clubbed). Bone mass continues to increase rapidly, often filling in the hollow middle of the bone where the bone marrow, which produces red blood cells, is found. Early-onset osteopetrosis can be a fatal condition, with death occurring before the age of two. About one-third of all children with malignant infantile osteopetroses die before age ten. Although this form of osteopetrosis is called "malignant," it is not a type of cancer . Intermediate osteopetrosis generally appears in children under age ten. This condition is usually less severe than early-onset or malignant infantile osteopetrosis and is not normally life-threatening. Adult (delayed-onset) osteopetrosis may not become evident until after age 20. 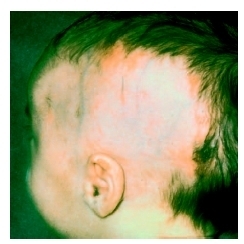 Albers-Schönberg disease is a mild form of this condition. People who have this disease are born with normal bone structure. Bone mass increases as they age but does not affect appearance, health, intelligence , or life span. Many people with adult osteopetrosis are diagnosed only when abnormalities are discovered on x rays taken for other purposes. There are two distinct types of adult osteopetrosis (types I and II). These types have different biochemical features. Individuals with type II disease have a higher risk of sustaining bone fractures . The incidence of osteopetroses is not known, although it is estimated that adult osteopetrosis occurs in about one of every 1,250 individuals. About 20,000 people in the United States have this form of the disease. Worldwide malignant infantile osteopetrosis occurs in about one in 100,000 to 500,000 births, making it exceedingly rare. Only eight to 40 children are born with this disease in the United States each year. Males and females appear to be equally affected. Osteopetrosis is the result of a genetic defect that causes the body to add new bone more rapidly than existing bone disintegrates. When fibrous or bony tissue invades bone marrow where red blood cells are made, the individual may develop anemia. Infection results when excess bone impairs the immune system, and hemorrhage can occur when platelet production is disrupted. When the skeleton grows so thick that nerves are unable to pass between bones, the individual may have a nerve damage, paralysis, or become blind or deaf. This infant has osteopetrosis, a condition which thickens and hardens the bone. Note the unusual shape of the skull. A doctor should be consulted if the child has frequent broken bones, bone pain, or failure of normal growth and development. Osteopetrosis is usually diagnosed when x rays reveal abnormalities or increases in bone density. Bone biopsy can confirm the diagnosis. Additional tests may be done to look for associated problems in vision, hearing, blood composition, and so forth. Interferon gamma-1b (Actimmune) is the only drug approved by the United States Food and Drug Administration (FDA) to treat osteopetrosis. Injections delay the progress of severe osteopetrosis in both children and adults. Bone marrow transplantation (BMT) is the only therapy that can completely cure severe malignant infantile osteopetrosis. It replaces the abnormal osteoclasts with normal cells. The survival rate for children with osteopetrosis who undergo BMT is 40 to 70 percent. Because of the high risk of death, this procedure is done only with the most severely affected children where a good bone marrow match can be found. High doses of calcitriol, an active form of vitamin D, can stimulate osteoclasts responsible for disintegration of old bone and significantly alleviate symptoms of severe disease in some individuals. When bone overgrowth deforms the shape of the skull, surgery may be required to relieve pressure on the brain. Orthodontic treatment is sometimes necessary to correct malocclusion , a condition that shifts the position of the teeth and makes closing the mouth impossible. Physical and occupational therapy can help children reach their full potential and adults to retain function and independence. Speech therapy is often needed in young children, because the heavy skeleton can cause language delays even in children of normal intelligence. Professional counseling can help children and their families cope with the emotional aspects of deformed features. The severity of anemia seems to determine the course of an individual's osteopetrosis. About two-thirds of children who have severe malignant infantile osteopetrosis die before age ten unless they have a successful bone marrow transplant. Individuals who develop the adult form of the disease have normal life spans, although they experience more bone fractures and complications related to compression of cranial nerves. Nerve compression can result in facial paralysis, deafness, or blindness. Osteopetrosis is an inherited disease that cannot be prevented. Parents with children who develop intermediate or adult forms of this disease as teens or young adults should be aware that their children are very susceptible to bone fractures and should avoid situations and sports where they are likely to be injured. Cranial nerves —The set of twelve nerves found on each side of the head and neck that control the sensory and muscle functions of the eyes, nose, tongue, face, and throat. Berkow, Robert, ed. The Merck Manual of Medical Information. Whitehouse Station, NJ: Merck & Co., Inc, 2003. Osteoporosis and Related Bone Diseases—National Resource Center. 1150 17th S. NW, Ste. 500, Washington, DC 20036. Web site: http://www.osteo.org. Bhargava, Anuj. "Osteopetrosis." eMedicine.com , March 19, 2002. Available online at http://www.emedicine.com/med/topic1692.htm (accessed January 16, 2005). "Information for Patients about Osteopetrosis." National Institutes of Health Osteoporosis and Related Bone Diseases—National Resource Center , August 2000. Available online at http://www.osteo.org (accessed January 16, 2005). research paper. may need to print but will work with just having the websitte to read.